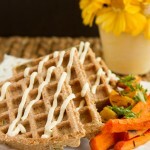 Grain-free crispy waffles made entirely of ground flaxseed. No flour, no grains, no sugar, just flax! Dress it up sweet or savory. 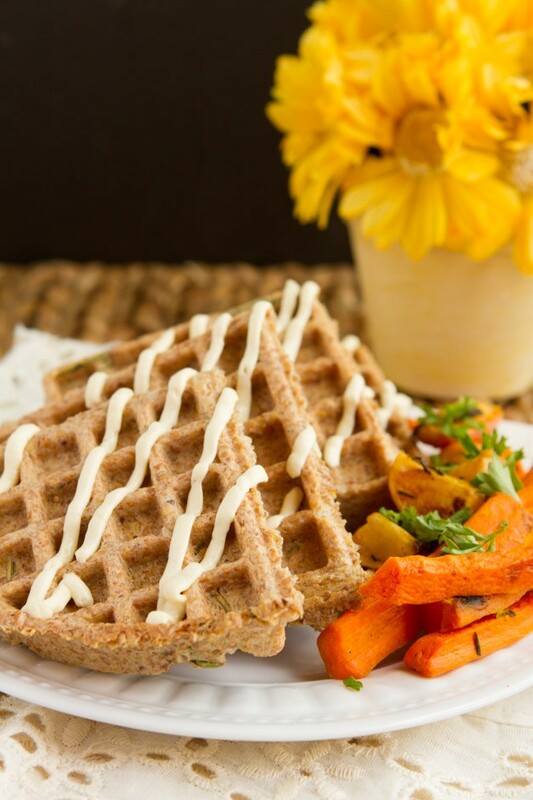 Place your waffle maker on the counter and heat on medium, or your desired setting for crisp waffles. Combine flax seed with baking powder and sea salt in a large bowl. Whisk to combine fully and set aside. Add eggs, water and oil to the jug of your high-powered blender. Blend on high for 30 seconds, until foamy. Transfer liquid mixture to the bowl with the flaxseed mixture. Stir with a spatula, just until incorporated. The mixture will be very fluffy. Once incorporated, allow to sit for 3 minutes. Add in your fresh herbs or stir in the ground cinnamon. Divide mixture into 4 servings. Scoop each; one at a time, onto the preheated waffle maker and close the top. Cook until it beeps and repeat with remaining batter. Eat immediately or freeze in an air-tight container for a couple of weeks. Can be frozen and then toasted for a quick breakfast, lunch or dinner. Fresh herbs: I like to use a combination of rosemary, parsley and thyme. Make it vegan or egg-free: replace eggs with 5 tablespoons finely ground flaxseed with 15 tablespoons of warm water. Let it sit for 5 minutes until it’s gooey. Alternatively, you can use 10 teaspoons of finely ground chia seed and 15 tablespoons warm water. Waffle maker: I have this Breville Smart Waffle Maker but in Canada, it’s a circle. It’s the same product, just different shape in the US. This waffle maker has a moat around it that catches all of the batter that oozes over the side of the standard waffle makers making cleanup a breeze! And it locks in while you cook for even waffles through and through.